World-renowned climber Hamish MacInnes believes this winter in Scotland's mountains is the snowiest since 1945. He said he had not seen such "colossal volumes" of snow since he started climbing as a youngster 69 years ago. Dumfries and Galloway-born Mr MacInnes is also the inventor of mountaineering equipment, including a stretcher. He said: "The first time I went climbing was in 1945 and I remember cutting our way through snow in Glencoe. "I've not seen anything like it until now. "This covering of snow we have just now is very alpine. There is a very defined demarcation line between where the snow starts and the bare grass below. "The volume of snow is colossal. It has been falling for weeks now." Mr MacInnes, whose first climb was Buachaille Etive Mor, added: "The biggest accumulations have been on the main plateaus." Designed the first all-metal ice axe, founded the Search and Rescue Dog Association and set up the Scottish Avalanche Information Service. Was an adviser on Clint Eastwood's film The Eiger Sanction and The Mission, starring Robert De Niro. He said the snow at the highest levels was powder, which for walkers is tiring to hike through and is also unstable, raising the risk of avalanches. Mr MacInnes, who has written extensively on hillwalking and climbing, said climate change could be a cause of this year's heavy snowfalls. He said he had been critical of climate change science in the past. "I wrote an apology to the people who predicted climate change," he said. "I thought it was just a historical pattern, it probably is to a large extent, but I did kind of poo-pooed the idea of climate change." 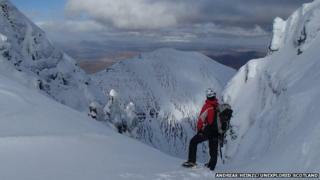 The veteran mountaineer added: "This snow is not just something happening in Scotland. "This turmoil is throughout the world. I have been in contact with people from all over the world, people in rescue teams, and they have got the same pattern - even more pronounced than us." Lochaber Mountain Rescue Team, the UK's busiest MRT, has suggested that the snow and also frequent strong winds have discouraged some walkers and climbers from heading into the hills. Team leader John Stevenson told BBC Radio Scotland: "It has been a quiet year. People are either behaving themselves, or the conditions are too bad for them to go out. "The conditions haven't been good this winter. There is no big route climbing going on." Mr Stevenson said there were plenty of safe areas for walkers to enjoy, but said they should check weather and avalanche risk forecasts before heading out and also make sure that they are well equipped for winter conditions. The team leader said even highly experienced mountaineers could be caught out. He said that during a call-out on Saturday two members of the Lochaber team fell through a cornice - an overhanging edge of snow - and another was caught in an avalanche. All three were unhurt. Nevis Range ski resort had its busiest day for 10 years on 16 February when almost 1,700 skiers and snowboarders took to the slopes. The resort was not able to operate all of its lifts because some were still buried under unprecedented amounts of snow. In January, the upper runs of three Scottish ski resorts - Glencoe Mountain, CairnGorm Mountain and Nevis Range - had more snow than those of Whistler in Canada, a venue for the last Winter Olympics. Mr Stevenson said: "It always something we have to expect will happen, but I think this time the boys got a bit of a wake up call." He added: "There have been some huge avalanches this winter. You can see them from the road." The Sportscotland Avalanche Information Service (SAIS) has recorded 219 avalanches so far this season, 116 of them in the last month. Last winter, the service recorded 129 avalanches. SAIS forecasters and winter skills instructors including Andreas Heinzl have been photographing the conditions this winter in areas such as the Cairngorms, Glencoe and Torridon.